Kalmar, part of Cargotec, has announced the launch of Gloria - a new range of reachstackers at TOC Europe 2013. These fifth generation machines are set to create the benchmark for productivity, operator comfort, safety and cost effective operation. 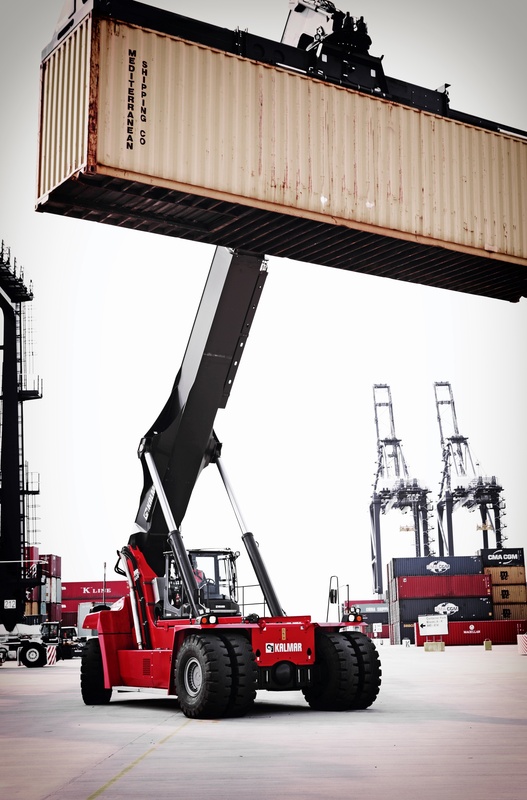 Following on from Kalmar's successful F-generation of reachstackers, the new G-generation will offer customers a wider choice, adding four extra models to the container handling range and three extra models for intermodal handling. The new range offers the ultimate operator experience with the key areas of safety and ergonomics being of utmost importance. For instance, Gloria comes with certain built-in safety options, such as reverse warning and a personal proximity aid system. Kalmar has been market leader in cabin design for a considerable number of years and now takes it to the next level. Featuring a cabin built on the latest ergonomic design, it offers over 90% guaranteed all-round visibility, even in the worst weather conditions. Amongst the many new features in the cabin is the unique, Kalmar patented, side tilting steering wheel and specially designed joystick control which also contribute to making Gloria the most operator friendly reachstacker on the market, by reducing fatigue and improving manoeuvrability and productivity. Gloria's electronics feature a redundant CAN bus control system which automatically locates and corrects all failures in the CAN bus operation. 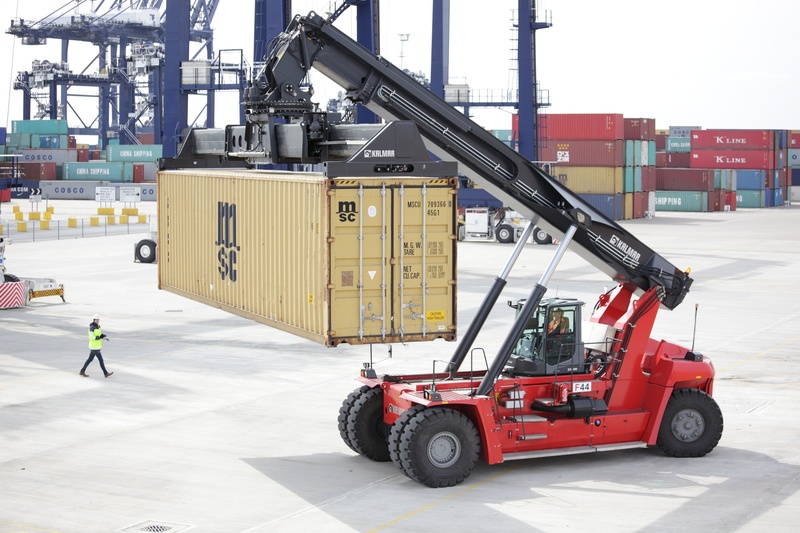 Kalmar is the only manufacturer to offer this feature as standard. Cost of ownership is further reduced with a number of innovative features. Fuel saving has been high on the agenda and significant economies can now be achieved through the load sensing hydraulics, fitted with variable pumps and a temperature controlled cooling fan. A tyre air pressure control system also contributes to fuel savings and extends the lifetime of tyres by up to 10%. Kalmar has also introduced radical changes to the service intervals and, as a result, calculated significant cost savings across many of the service related intervals. A two-year or 4000-hour warranty now comes as standard; the first machine service has been extended from 50 to 500 hours and the hydraulic oil change interval extended from 2000 to 4000 hours; or more with the Oil Sample Programme. Engine oil servicing is now also extended from 500 to 1000 hours and the servo filter from 500 to 1000 hours. 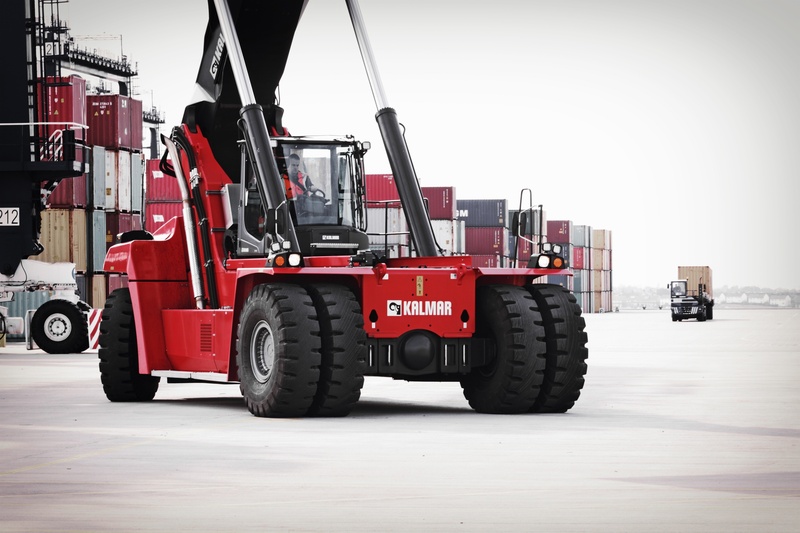 Mikael Persson, Vice President, Reachstackers and Empty Container Handlers at Kalmar said, "Kalmar has continually been the primary choice for reachstacker solutions in the industry. Our fifth generation reachstacker really is a groundbreaking machine that dramatically improves productivity, operational intelligence, safety and lowers the cost of ownership to really impressive levels. It was time to move our customers ahead again and these new generation machines represent a milestone in reachstacker performance. Without exception, Gloria is now the leader of the pack."